The world of Warner Bros.’ Batman Beyond franchise has given us fascinating glimpses of what could be in store for Gotham City in the not-too-distant future—like a withered, old Bruce Wayne and a new generation of Joker acolytes. 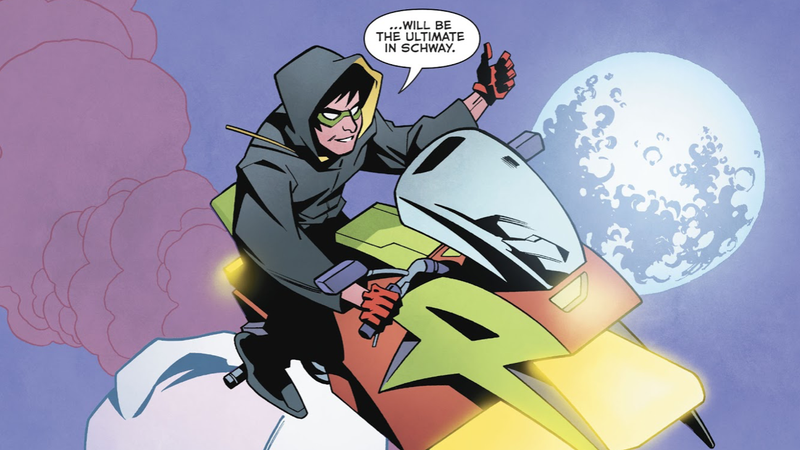 Now, the DC Comic’s title based on the beloved animated series has given us a new Robin. Wayne Manor has become something of a familial environment once again, thanks to Bruce’s mentee Terry moving in and schlepping his teenaged brother Matt along. Together, the McGinnis family have become the latest incarnation of Bruce’s family—something he needs considering that a.) Gotham city’s still very much in constant threat from supervillains and b.) Bruce’s just recently had serious back surgery. While Terry patrols the streets as Batman, Bruce has provided support and intel from the safety of the Batcave, where he’s been able to monitor Terry’s exploits in the city. Matt, on the other hand, has been spending his time going over old footage of a much younger Bruce training Damian Wayne in his earliest days as Robin. As Terry and Bruce have been doing battle with a resurrected Royal Flush Gang, Matt’s slowly but surely been building up his own combat skills, biding his time for the perfect opportunity to enter the fray on his own. And that’s exactly what happens in Batman Beyond #18. After a long game of cat-and-mouse with the terrorist known as Payback, the Batsquad finally learns the identity and origin of its newest villain. During their latest battle, Payback explains that he was driven to crime after Bruce (as Batman) caused his son to be committed to Arkham Asylum where he was left vulnerable and defenseless. As payback for his son’s ultimate demise, the villain vows to exact his revenge on the Bat Family—and for a moment it seems as if he’s very much going to achieve his goal due to Terry’s being critically injured. With Bruce barely able to walk and Terry barely clinging onto consciousness, it falls to Matt to step up to the plate, something he does with glee by taking a sledgehammer to the glass case where Bruce keeps all of his old costumes. Matt stepping into his new identity. Bruce is uncharacteristically chill about Matt rushing off to play dress-up, but his reaction underscores the bittersweet truth that’s always been lurking in the margins of Batman Beyond: Eventually, Bruce is going to die and Terry’s going to need to start building a team of his own. Now, he can finally get around to doing that.